Cornelius Cardew composed experimental works for each of the seven paragraphs of The Great Learning by Confucius (translated into English by Ezra Pound). Each piece is for different instrumentation. In March of 2017 we presented Paragraph 2, for drums and voice: groups were situated around our outdoor arcade, each group consisting of one drummer and a number of singers. The drummers play through twenty-six rhythms, in any order each chooses, while the associated vocalists sing the text from Confucius on notes that evolve slowly, timing their entrance to the downbeat of their particular drummer. Each group is autonomous, and each performance unique. At our performance the audience was free to move around the space, sampling individual groups or taking in the aggregate from a central position, and were encouraged to join in as singers. You can see video of our performance of The Great Learning, Paragraph 2 on March 4, 2017 outdoors in New College's PepsiCo Arcade below. Paragraph 7 is less raucous than Paragraph 2, being for singers only. Each singer chooses a pitch to begin, and sings the first line ("If"—see the score below) softly eight times, each time for the length of a breath. Then she moves around the space, listening to other singers, until hearing a new pitch of her choice, at which time she sings the second line ("the root", five times) on that pitch. Everyone progresses through the piece this way, as a cloud of pitches gradually coalesces into several clusters. The audience moves throughout the space, similarly to the singers, so the piece is a locomotive and auditory kaleidoscope. New Music New College has performed Cornelius Cardew's The Great Learning, Paragraph 7 a number of times: in November of 2003 in the Isermann Gallery of the Caples Fine Arts Complex; in February of 2004 in the College Hall Music Room; in March of 2008 at the (late, lamented) mack b gallery in a hanger near Sarasota Airport; and as a free workshop performance (with audience members encouraged to participate) in October of 2012 in the lobby of the Sainer Pavilion. Most recently we performed it as a free event in March of 2017 in the Jane Bancroft Cook Library, and Stephen Miles and R. L. Silver led a group performance of it to open the 2017 New Music Gathering at Bowling Green State University in Ohio. Click here to download a copy of the score that you can print. New Music New College focuses primarily on very recent music, yet we also perform relevant repertoire from the second half of the twentieth century—music by John Cage, Karlheinz Stockhausen, Pauline Oliveros, Luciano Berio, among others. 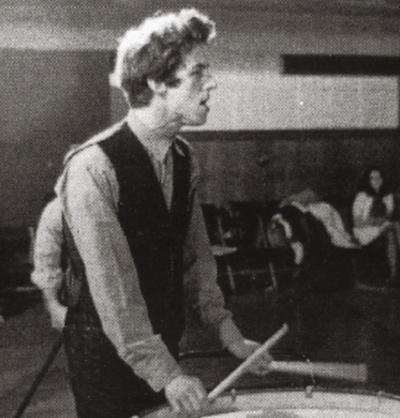 While these composers have long been acknowledged as great innovators of contemporary music, Cornelius Cardew’s contribution has been less well understood. To be sure, there was a time when Cardew was viewed as central to the new music scene. Consider this statement of Morton Feldman in 1966: “Any direction modern music will take in England will come about only through Cardew, because of him, by way of him. If the new ideas in music are felt today as a movement in England, it’s because he acts as a moral force, a moral centre” (quoted by Michael Nyman in Experimental Music: Cage and Beyond, 115). A moral force indeed: Cardew was at all times in his career concerned not only with the expansion of music’s sonic possibilities, but with the relationship of music to politics and issues of social justice. The influence of Cardew’s concepts and technical innovations on experimental music has been enormous, yet performances of his music have been infrequent in recent years, especially in the United States. Also, he has not always received his due from critics. This is partly because Cardew altered his compositional methods radically over time, thus presenting a complex and even a contradictory profile as a composer. However, this neglect could also be a backlash against his politics, a politics that early on fostered experimentation but later stifled it in the extreme. NMNC is offering Cardew now for three reasons. First, Cardew’s music, particularly that of The Great Learning, may be regarded as an antecedent to much we explore in this Experimental Music class: a desire to understand and alter the social dynamics of music and performance. Second, Cardew’s career says much about the potential for integrating music and politics, while also reminding us of the need to retain some measure of aesthetic autonomy: political consciousness can enlarge our understanding of musical possibilities through critique, yet music can expand political consciousness through aesthetic experience. Each domain must challenge the other. Finally, Cardew’s music has long been overshadowed by his ideas and warrants a fresh hearing. When the students and I undertook a workshop performance of The Great Learning, Paragraph 7 in 2003, we did so out of historical interest. We soon discovered that The Great Learning, Paragraph 7 is great music, and have offered it again in 2004 and 2008. Born in England in1931, Cardew became involved on the continental music scene during the late the 1950's, years that marked the consolidation of the postwar avant-garde’s achievement. Cardew worked with Stockhausen from 1956 to 1960, serving as the composer’s assistant in the production of Carre, and was associated with Cage for fully a decade (1958-68). As a performer, writer, and organizer of concerts, Cardew actively promoted the music of these and other adventurous composers, including Pierre Boulez, Christian Wolff, and Terry Riley. Cardew thus established his credentials as an experimental music professional during these years, yet that very professionalism eventually struck him as problematic: Cardew viewed contemporary music increasingly as the occupation of a highly trained elite, completely removed from the experience of the general public. Dissatisfied with this situation for both musical and political reasons (Cardew had become active in leftist politics at this time), Cardew became interested in music that could bridge the gap between amateurs and professionals. Cardew’s compositional response to this challenge during the years 1963-67 was Treatise: a graphic score of nearly 200 pages. Experimental composers such as Morton Feldman, Christian Wolff, and Earle Brown had been using graphic scores for years, but Cardew’s was different: he provided no instructions for interpretation of the images. The performer is presented with page after page of complex combinations of circles, lines, squares, triangles, and their derivatives, yet no instrumentation is specified, nor is the relationship of the images to pitch or rhythm in any way explained. The performers of Treatise must study the images and realize them through improvisation or in fully-notated compositions. Writing some years later in his Treatise Handbook, Cardew stated his intention [“Each player interprets the score according to his own acumen and sensibility. He may be guided by many things—by the internal structure of the score itself, by his personal experience of music-making, by reference to the various traditions growing up around this or other indeterminate works, by the action of the other musicians working on the piece, and—failing these—by conversation with the composer during rehearsal. (Treatise Handbook, Edition Peters, 1971, xii)]. Treatise is perhaps best regarded less as a composition than as a stimulus to composition. In its breadth, complexity, and rigor, Treatise was an enormous achievement, yet it did not lead to a subsequent series of graphic works. Instead, Cardew sought to create music that not only was accessible to amateurs, but that could be performed by large groups of people. Part of the solution, Cardew believed, was to establish a community of performers, a community that embraced individuals of varied talents and backgrounds who would approach music-making in a collective manner. This was the impetus behind The Scratch Orchestra, the focus of Cardew’s activities in London during the years 1969-72. As described in “A Scratch Orchestra: draft constitution” (Cardew, Scratch Music, 10-11) the ensemble of professional and nonprofessional musicians engaged in improvisation rites, “scratch music” (structured improvisation), popular classics (traditional works, freely adapted from memory by the performers at hand), composition, and research projects. Since most of this music was improvised to some extent and was not recorded, it has faded from memory. The notable exception is The Great Learning, Cardew’s monumental setting of a text by Confucius. If Treatise stands as Cardew’s major composition of the 1963-66, The Great Learning is his masterwork of the Scratch Orchestra period. One of the canonical books of Confucianism, The Great Learning consists of seven paragraphs, each devoted to the pursuit of moral authority. As Paragraph 3 states, “Things have their root and branches. Affairs have their end and their beginning. To know what is first and what is last will lead near to what is taught in The Great Learning.” Authority thus follows from knowledge of root causes and their ramifications. 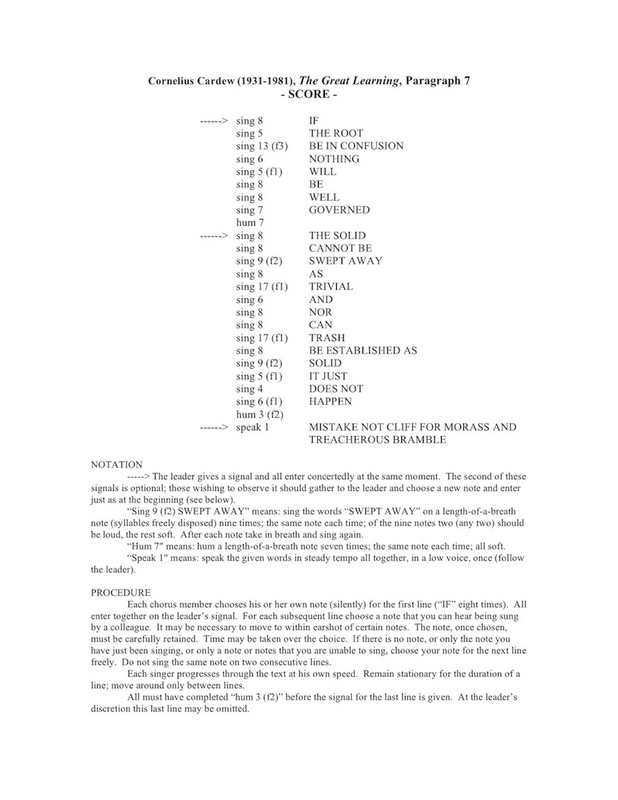 Cardew set all seven paragraphs of the text, though each is scored for different forces. For example, the score of Paragraph 1 calls for the use of whistles and drones, while Paragraph 2 is basically a competition between singers and drummers. Paragraph 7 is entirely vocal and can be performed by any number of singers. In our experience, the piece is most effective when it is performed by 20-25 singers. Cardew’s setting of Paragraph 7 offers many rewards for the performers. First, the work achieves a Cagean balance of freedom and discipline: the performers choose which pitches to sing, but the choice of pitches is severely constrained. Second, the relationship between the individual and the collective is mediated skillfully: performers contribute to a larger mass of sound, yet each performer articulates the text differently, breaths and enters at a different pace, and stands out from the crowd at those moments when the text must be sung in a loud voice. Finally, the music demands that the performers remain aware of each other at all times. Anyone who has ever sung in a choir knows that listening is perhaps the most important part of the job. However, in The Great Learning, Paragraph 7, the music’s pitch structure is actually determined by listening: when performers select a new pitch for each line of the text, they may only adopt one that they hear being sung at that moment, with the additional stipulation that a singer may never use the same pitch for two consecutive lines. Given the spirit of Cardew’s piece, one might think that it is intended entirely for the performers’ enjoyment, that an audience is superfluous. This would be a mistake. The work offers many pleasures and discoveries for those listeners who are patient. Listening and watching a performance of The Great Learning, Paragraph 7 is a bit like watching the gulf from the shore. Though the larger shape of the water seems to change so slowly that it can scarcely be perceived, the details are constantly in flux: the waves crest and fall and the wind alters the water’s surface in countless ways. Also, one’s experience of the water changes, depending upon one’s location: the water’s churning takes on one quality when viewed from a distance, yet can seem utterly different while walking the shoreline, dodging the waves. I suggest that listeners at today’s performance explore various options: everyone should feel free to move around, to draw near to the performers, or even to leave the performance space for a short while. Sitting still in one place for the duration of the performance is also an option, though it is perhaps the most demanding one: it might be a bit like watching a film of the gulf, shot with a single camera from a fixed location. The Scratch Orchestra marked a utopian moment in the history of experimental music. It collapsed, not because it ceased to offer vibrant musical experiences, but because the principal members fell into ideological disputes. The accounts of these developments (see Rod Eley’s article in Stockhausen Serves Imperialism!) are tragicomic: politics ultimately trumped musical experience and what had been an experimental collective became a Marxist-Leninist agitprop organization. Determined to compose music that would be fully comprehensible to the British working class, Cardew began in 1973 to produce music that was staggeringly traditional. His works for solo piano, We Sing for the Future and Thälmann Variations, take late Beethoven as their model, not only in form but in harmonic structure as well. During this same period, Cardew even composed Maoist folk songs on revolutionary themes. Politically, Cardew took what seemed to him a logical step; musically, his was one of the great about-faces in music history. What then is the last word on Cardew? His death by a hit-and-run motorist in 1981 has complicated that question. How might Cardew have developed had he lived another twenty years? Would he have continued to compose political music or would he have abandoned music altogether in favor of political organizing? Might he have found a way to reconcile the diverse and conflicting practices of his compositional career? Though these questions will never be answered, Cardew most certainly occupies a permanent place in the history of late 20th-century music. His compositions, however, needs to be experienced, not simply cited as historical footnotes. Today’s performance of The Great Learning, Paragraph 7 is undertaken in tribute to the living spirit of Cardew’s music. Cardew, Cornelius, ed. Scratch Music (Cambridge, Mass. : Latimer, 1971). Cardew, Cornelius. Treatise Handbook (New York and London: Editions Peters, 1971). Cardew, Cornelius. Stockhausen Serves Imperialism! (London: Latimer, 1974). Griffiths, Paul. Modern Music and After: Directions Since 1945 (Oxford and New York: Oxford University Press, 1995). Nyman, Michael. Experimental Music: Cage and Beyond, Second Edition (Cambridge: Cambridge University Press, 1999). Potter, Keith. “Cornelius Cardew: Some (Postmodern?) Reflections on Experimental Music and Political Music,” New Music, Aesthetics and Ideology/Neue Musik, Ästhetik und Ideologie, ed. Mark Delaere (Wilhelmshaven: Florian Noetzel, 1995), 152-69. Cornelius Cardew Chamber Music 1955-65, Apartment House Ensemble (Matchless Recordings MRCD29). Treatise (1963-1967), performed Jim Baker, Carrie Biolo, et al, Art Lange, conductor (ART 2-122). We Sing for the Future and Thälmann Variations, performed by Frederic Rzewski, piano (New Albion NA116).